Jaime King could do no wrong in our eyes. Even when she was heavily pregnant, she still managed to wow us with her chic sartorial choices. Now that she’s had the child, she still looks as stylish as ever. Recently, she attended the T-Mobile Uncarrier x Launch event wearing an ensemble straight out of the Zimmermann Spring 2016 runway. The 36-year-old displayed her flawless mile-long legs in what looks like a pair of flared striped shorts from the Zimmermann Spring 2016 collection. 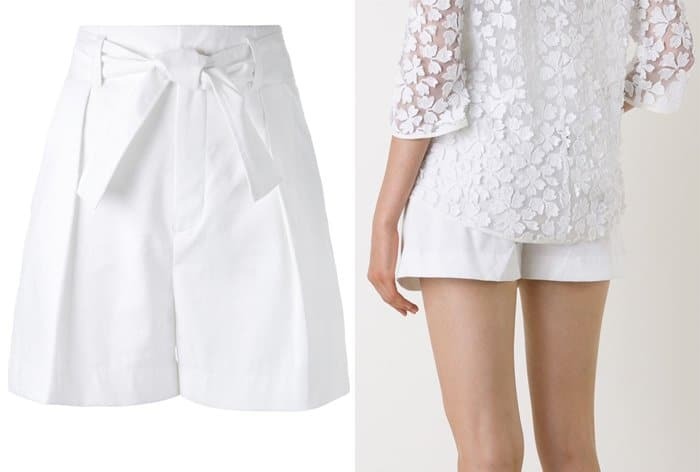 The shorts have lace detailing peeking out from the hem and a drawstring tie to keep them snug around the actress’ miniscule waist. Jaime copied the runway look and wore the shorts with a see-through ruffled top and a pair of scalloped sandals, also from the same collection. Despite the abundance of lace and frills in this look, we’re not at all repulsed by the feminine flair of it. It brought just the right amount of fresh and youthful vibe from the actress without being too twee.